So predicted the Hastings County Directory in 1869 (p.26). 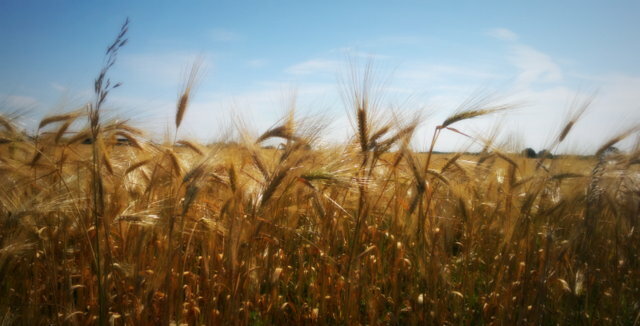 Barley was a huge crop in this area in the 1860s and through to the 1890s; most of it being exported to brewers in the United States, who rated it more highly than more locally-grown grain for making beer. The price of barley dropped precipitously after the passing of McKinley's Tariff Act of 1890, which imposed punishing levies on imports in order to protect US farmers. Here in the County, farmers turned to other crops instead, with tomatoes, peas and corn taking over the acreage previously devoted to barley. Canning factories sprang up to process these highly perishable but easily preservable foods. Soy beans and corn seem to be the main crops grown in the County today, but it's still possible to find fields of wheat and barley. Now that it's almost ready to harvest I couldn't resist stopping to take some photos of a nearby barley field. I doubt garlic was one of the crops that County farmers would have turned to after the decline of the barley days, but it seems to thrive even in our fairly stony soils here. I plaited these and have hung them up in the unheated section of our basement, where they should keep fairly well into the winter (well, apart from those I replant in October for next year's crop). And it's probably too soon to be looking up plum jam recipes,* but for the first time in six years it looks like we might get some fruit from our Stanley plum tree, as well as the apples and pears I noticed earlier. Very exciting! *Not that this has prevented me.